In honor of National Jewel Day on March 13, Vicki Priebe, author of the new book Cheap Gold and Silver, shares five secrets for finding fine jewelry for cheap prices. These beautiful pieces of jewelry make excellent gifts that don't break the bank. In addition to these secrets, IFind Entertainment is also celebrating this holiday with a contest giving away a sterling silver bracelet on their web site. 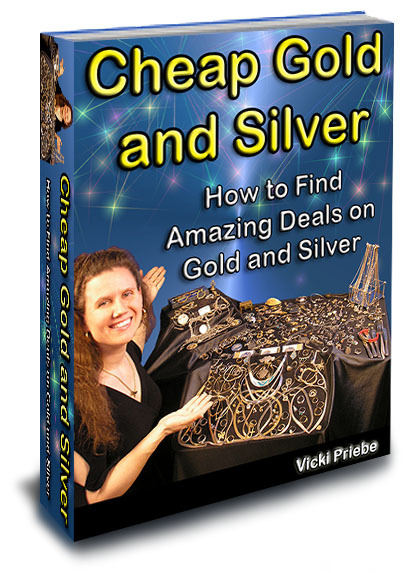 In honor of National Jewel Day on March 13, Vicki Priebe, author of the new book, Cheap Gold and Silver: How to find amazing deals on gold and silver, reveals five secrets for finding cheap deals on fine jewelry. In addition to these secrets, IFind Entertainment is also celebrating with a contest giving away a sterling silver sea turtle bracelet on their web site, since this holiday is all about giving and receiving jewelry. Ms. Priebe asks, "What wives, mothers, daughters, sisters and nieces would not love to receive jewelry as gifts? After all, they are girls and what girl does not love beautiful jewelry?" For instance, the author gave her mother a 14 K gold "M" pendant and necklace. These pieces were bought at two separate yard sales for fifty cents a piece. For one dollar, Ms. Priebe gave her mother a gift that would have cost one hundred dollars retail. "If a buck isn't a cheap price, I don't know what is. The best part is no one knows the gift only cost a buck; that's frugal gift giving at its finest," continues Priebe. During these tough economic conditions, every penny counts. There is no need to sacrifice a loved ones happiness on special holidays, because of finances. Gold and silver jewelry remains affordable depending on the buyer's knowledge. 1) Location – People have to know where to look for undervalued jewelry. Not all jewelry is sold at jewelry stores. Jewelry is also sold by individuals and secondhand stores, like garage sales, rummage sales, moving sales, yard sales, estate sales, thrift stores, auctions, flea markets and web sites (such as eBay and Craigslist). It is surprising that some of these individuals and secondhand locations sell fine jewelry for very cheap prices. 2) Purity marks – There are some marks used to indicate gold and silver that are not well known. Therefore, jewelry items bearing these marks are sold as if the jewelry is costume. Here are just a few of these purity marks; keep an eye out for 417, 585, and 750. These marks indicate the purity of the gold in the piece. 3) Old Utensil Pieces – Crafters love to breathe new life into old pieces. Watch for utensils such as spoons and forks turned into jewelry, such as bracelets, rings, or brooches. The utensils might be made of sterling silver. If this is the case, then it is a sterling silver jewelry piece. 4) Techniques – While visiting the locations listed above in item one, most people only look on tabletops where items are displayed. People that only look there are missing items. For instance, bottoms of bins are great places to search for gold and silver jewelry. 5) Broken Stuff – Broken gold and silver pieces are not junk, but some people think they are worthless. It is not uncommon to buy a broken gold necklace for a dollar. Then take it to a jewelry store and have it fixed. That means an expensive gold necklace was purchased for a very cheap price. Don't have time to find cheap jewelry to give on National Jewel Day, keep in mind the book, Cheap Gold and Silver, is a gift in itself. It can even be purchased last minute, since it is available as an eBook. Cheap Gold and Silver teaches people the tips, tricks and techniques to buy gold and silver jewelry for cheap prices. Readers will appreciate it all year long and the book is suitable for all ages, including teenagers. Think about it, the book's information has the potential to give the reader jewelry for a lifetime. What female wouldn't love to learn how to buy gold and silver jewelry at cheap prices? Finally, don’t forget to enter the contest by submitting the entry form, on IFind Entertainment's web site (http://www.ifindtreasure.com), for a chance to win the sterling silver sea turtle bracelet. Cheap Gold and Silver: How to find amazing deals on gold and silverCover Picture of the New Book - Cheap Gold and Silver: How to find amazing deals on gold and silver Cheap Gold and Silver Book SampleThis is the free book sample for Cheap Gold and Silver in pdf format.